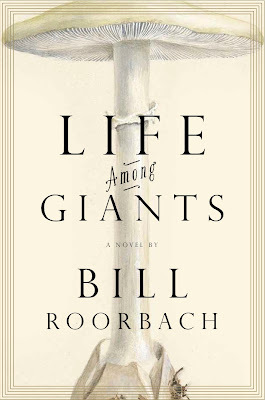 I first came across Life Among Giants by Bill Roorbach earlier this year when I was flipping through the BEA* Buzz Books and after reading the sampler, I was interested to read more. Life Among Giants tells the story of David, “Lizard”, a privileged young man who witnesses the killing of his parents at a high-class restaurant. David is shocked, understandably, and he spends his whole life trying to figure out exactly what happened. Since the novel is told through several time shifts, readers see David’s growth and inability to get over his parent’s murder. Even when he opens a restaurant, David revisits the memories of that day and so does his sister. David’s sister, Kate, was at college when the murder happened, and perhaps out of guilt, the mystery of their parents’ murder consumes Kate. The plot of the book isn’t terribly new, but it’s in the delivery of the novel that makes Life Among Giants stunning. The plot is full of twists and turns, minor ones really, that flow naturally, from jumps to time and character development. What makes Kate so tragic or surprising, which one I can’t really decide, is that fact that she’s a rebellious character who appears so nonchalant throughout her childhood and even into her adulthood but she’s anguished by her parents’ murder. David, on the other hand, is plagued by it, but not the way Kate is. Kate is obsessive about solving the murder, often going to great extents while all David wants to do is to move on. The book isn’t just focused on the mystery, which is nice. It covers the pains of growing up, the difficulty of balancing family with the truth, and what love is. Life of Giants is made up of many minor stories, such as David’s attraction to Sylphide, his neighbor who lives at a mansion the size of a museum. Sylphilde’s life is connected with David’s and Kate’s lives more than they know. Reading Life Among Giants, I was reminded of The Great Gatsby, since there is a similar theme of shining riches that obscure disaster. I don’t know how to put it into words further but Life Among Giants definitely has a je ne sais quoi** that just creates an atmosphere that reminds me of Gatsby. “I have a thing about last meals. Not as in prisoners about to be executed-they know it’s going to be their last. But as in just about everyone else, most of us. Whatever’s coming, there’s going to be that last thing we eat.. Though it’s an impossible proposition, I try to take life that way, too: every bite my last." In our nice stone house- three bedrooms, huge yard sloping to willow-wept water, one-car garage- we thought of ourselves as of modest means. Because across the pond, on what was called the High Side, there loomed an immutable example of what it was to be truly rich: a mansion the size of an embassy. Despite months and then years and even decades of conjecture and investigation and conspiracy theory, answers were not forthcoming. The sorrow and disbelief (some say madness) on Sylphide’s veil shadowed face in the famous photo of her standing at his [Dabney] graveside in New Castle England- well it still haunts me, haunts everyone, the closing visual bracket on an era that begins with John-John Kennedy saluting at the graveside of his dad. *On a semi-related note, I might go will go to BEA (Book Expo America) 2013. ** Always resort to French terms when you don’t know what to say. *** Finally posted this review! Been super busy lately. Thank you! Ooh, that'll be fun! :D Hope to see you there!